Here's another page by me. 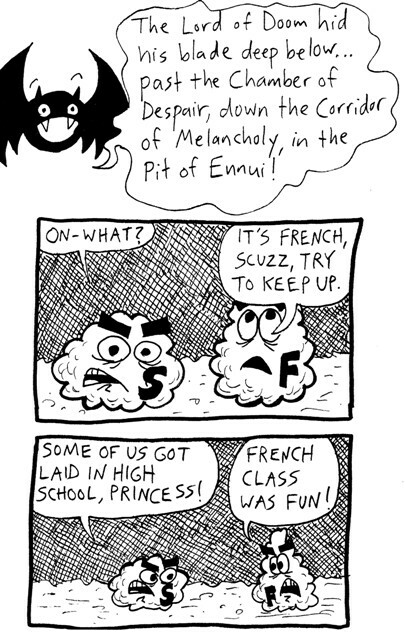 We use the word "ennui" a lot in my household. Also "melancholy" and "despair." I guess the joke is that the order is backwards, as you would expect that the final step would be the Pit of Despair, not the Pit of Ennui. Is that a joke? I don't know, I wrote this very quickly. My senior year of high school I was the vice president of the French Club. The president was, of course, Mr. D.F. French. He was a much better French student than me. He ended up flaking out, though, and I assumed most of the duties and responsibilities. ...SO LAYTON YOU'RE THE REAL #2(stuck on cps)...5o suzzball is even and fuzball is odd but he does the evin pages...i don't know ,,,just find the $%^&ING SWORD...'HI' ALICE.